Fig. 1. — It Is Well Known That the Moon, M., Always Turns the Same Face Toward the Earth, E, as the Black Arrows Indicate. 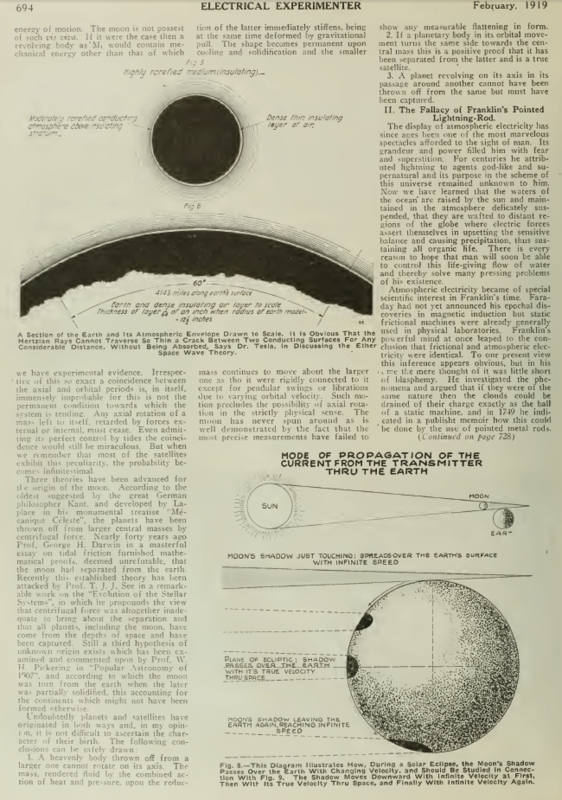 The Parallel Rays From the Sun Illuminate the Moon In Its Successive Orbital Positions as the Unshaded Semi-circles Indicate. Bearing This in Mind, Do You Believe That the Moon Rotates on Its Own Axis? Fig. 2. 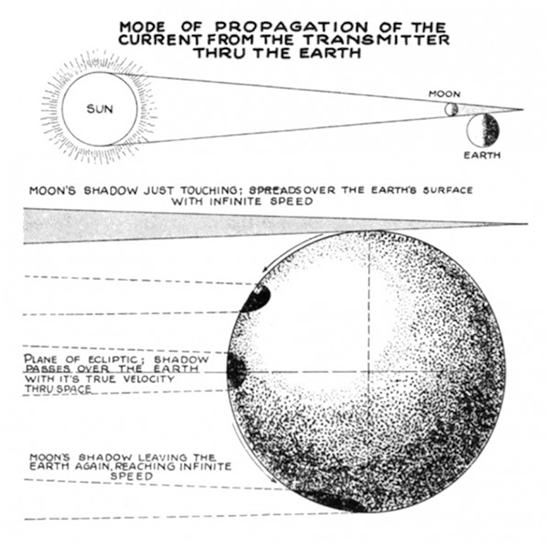 — Tesla's Conception of the Rotation of the Moon, M, Around the Earth, E; the Moon, In This Demonstration Hypothesis, Being Considered as Embedded In a Solid Mass, M,. 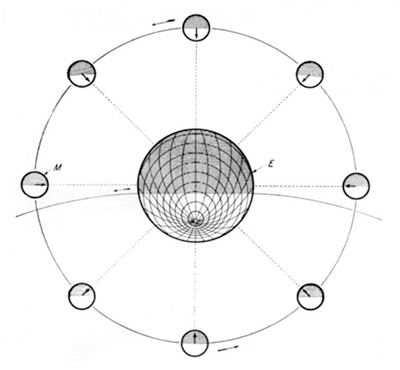 If, As Commonly Believed, the Moon Rotates, This Would Be Equally True For a Portion of the Mass M?, and the Part Common to Both Bodies Would Turn Simultaneously In "Opposite" Directions. Fig. 3. 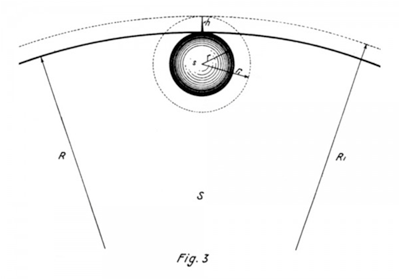 — Diagram Used to Explain the Fallacy of the Franklin Pointed Lightning Rod, and an Analogy Whereby the Author Shows In a Clear Manner How the Charged Sphere May for Illustration be Considered as Heated to a High Degree, and the Heat Allowed to Escape at a Known Rate. Fig. 4. — Tesla Explains the Fallacy of the Franklin Pointed Lightning Rod, Here Illustrated, and Shows that Usually Such a Rod Could Not Draw Off the electricity In a Single Cloud In Many Years. The Density of the Dots Indicates the Intensity of the Charges. to Scale. It is Obvious That the Hertzian Rays Cannot Traverse So Thin a Crack Between Two Conducting Surfaces For Any Considerable Distance. 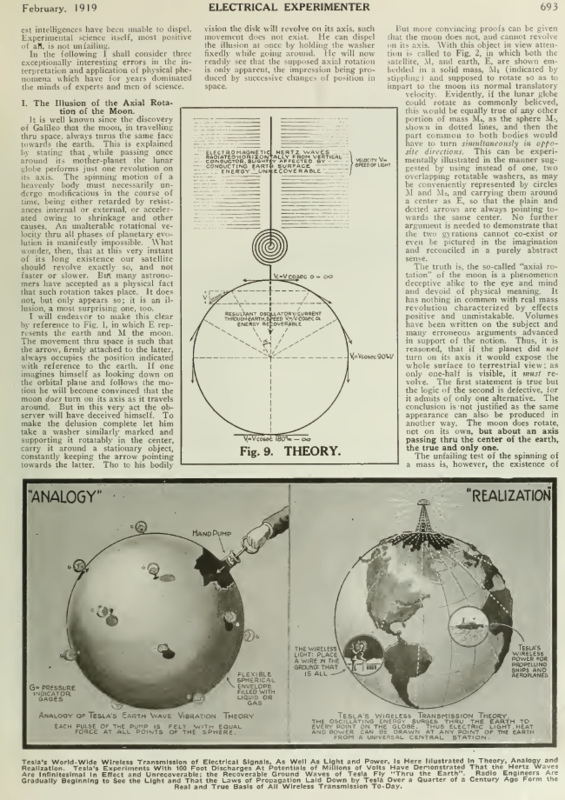 Without Being Absorbed, Says Dr. Tesla, in Discussing the Ether Space Wave Theory. Fig. 7. — The Theory Has Been Seriously Advanced and Taught that the Radio Ether Wave Oscillations Pass Around the Earth by Successive Reflections, as Here Shown. The Efficiency of Such a Reflector Cannot be more than 25 Percent; the Amount of Energy Recoverable is a 12,000-mile Transmission being but One Hundred and Fifteen Billionth Part of One Watt, with 1,000 Kilowatts at the Transmitter. We are living on a planet of well-nigh inconceivable dimensions, surrounded by a layer of insulating air above which is a rarefied and conducting atmosphere (Fig. 5). This is providential, for if all the air were conducting the transmission of electrical energy thru the natural media would be impossible. My early experiments have shown that currents of high frequency and great tension readily pass thru an atmosphere but moderately rarefied, so that the insulating stratum is reduced to a small thickness as will be evident by inspection of Fig. 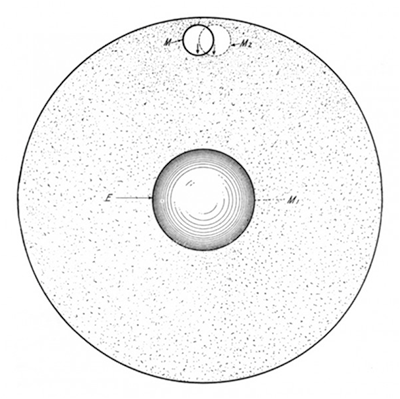 6, in which a part of the earth and its gaseous envelope is shown to scale. 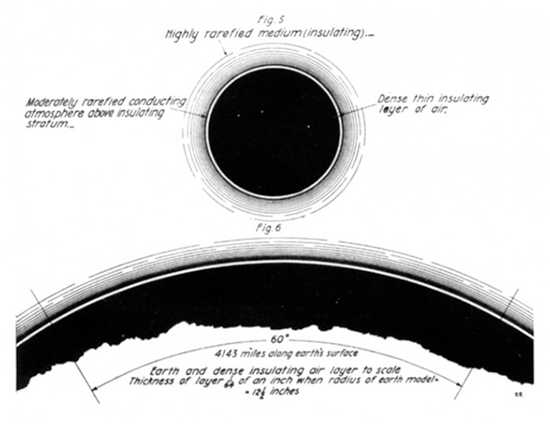 If the radius of the sphere is 12½”, then the non-conducting layer is only 1/64″ thick and it will be obvious that the Hertzian rays cannot traverse so thin a crack between two conducting surfaces for any considerable distance, without being absorbed. 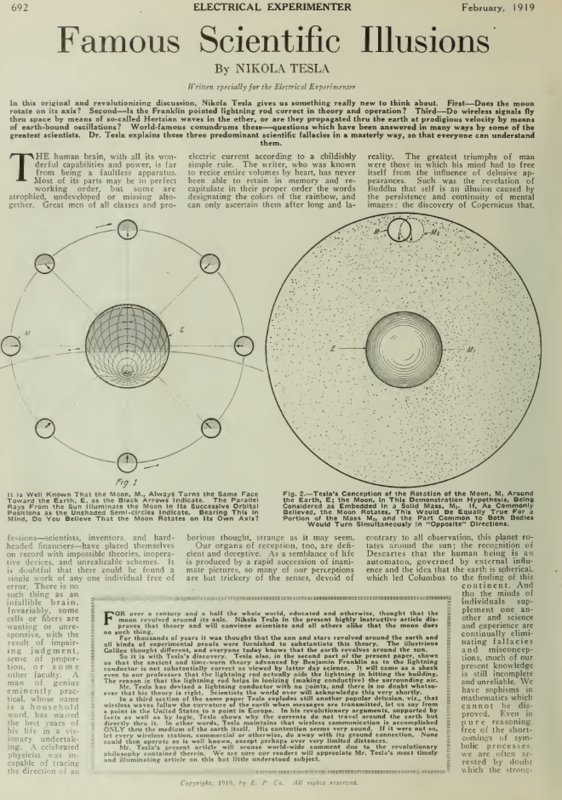 The theory has been seriously advanced that these radiations pass around the globe by successive reflections, but to show the absurdity of this suggestion reference is made to Fig. 7 in which this process is diagrammatically indicated. 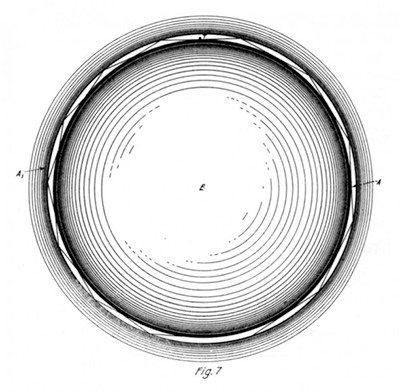 Assuming that there is no refraction, the rays, as shown on the right, would travel along the sides of a polygon drawn around the solid, and inscribed into the conducting gaseous boundary in which case the length of the side would be about 400 miles. As one-half the circumference of the earth is approximately 12,000 miles long there will be, roughly, thirty deviations. The efficiency of such a reflector cannot be more than 25 per cent, so that if none of the energy of the transmitter were lost in other ways, the part recovered would be measured by the fraction (¼). Let the transmitter radiate Hertz waves at the rate of 1,000 kilowatts. Then about one hundred and fifteen billionth part of one watt is all that would be collected in a perfect receiver. In truth, the reflections would be much more numerous as shown on the left of the figure, and owing to this and other reasons, on which it is unnecessary to dwell, the amount recovered would be a vanishing quantity. Fig. 10. 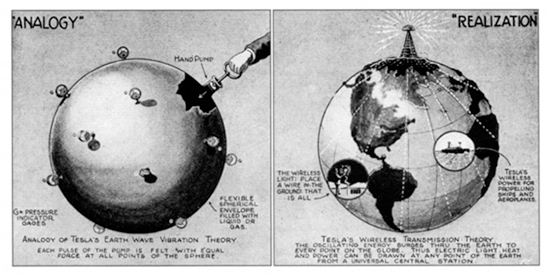 — Tesla's World-Wide Wireless Transmission of Electrical Signals, As Well As Light and Power, Is Here Illustrated in Theory, Analogy and Realization. 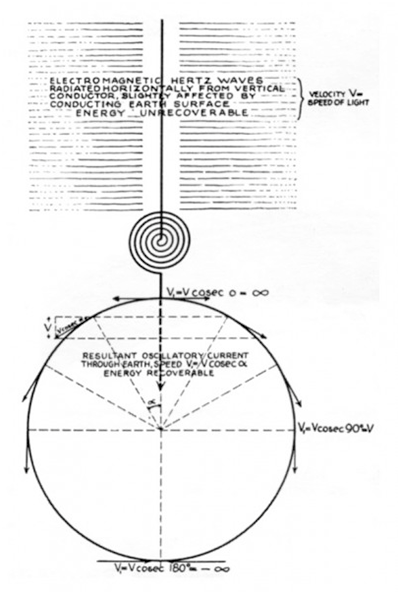 Tesla's Experiments With 100 Foot Discharges At Potentials of Millions of Volts Have Demonstrated That the Hertz Waves Are Infinitesimal In Effect and Unrecoverable: the Recoverable Ground Waves of Tesla Fly "Thru the Earth". 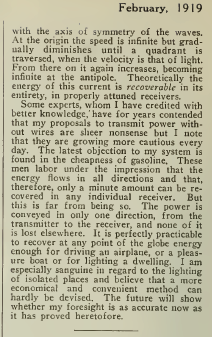 Radio Engineers Are Gradually Beginning to See the Light and That the Laws of Propagation Laid Down by Tesla Over a Quarter of a Century Ago Form the Real and True Basis of All Wireless Transmission To-Day.